Chicago's Near North side, bounded by North Avenue to Chicago Avenue and Wells Street to Halsted, has witnessed dramatic change in recent years as the Chicago Housing Authority's Cabrini-Green project was demolished and replaced with mixed income housing. The neighborhood, in the shadow of the Gold Coast, has long been home to people of modest means who now are fighting for real estate turf at a time of rapidly changing economic conditions. 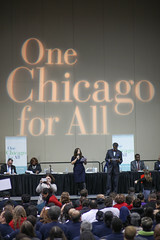 The Near North Unity Program (NNUP) was formed in November 2010 to promote and strengthen community cohesion in Chicago’s Near North community and to connect existing sub-communities into a resilient neighborhood by building upon local strengths through planning, organizing and human development. Learn more about the neighborhood, and NNUP, on the Near North portal. LISC is helping community organizations get a grip on municipal data to make the case for what their neighborhoods need. Plans issued from on-high have shaped, and mis-shaped, Chicago’s Near North neighborhood for over a half century. But now there’s a new plan, one guided by folks who actually live there. Public housing tenants and condo owners are finding common ground at NNUP. Near North condo owners and CHA tenants get real about building a viable mixed-income community--and that means putting some underlying tensions on the table. For as long as anyone can remember, East has not met West on Chicago’s Near North Side. Now comes the Near North Unity Program. The 2010 Hoops in the Hood Cross-City Tournament winners for the Major Division from East Garfield also won a victory for their neighborhood, for the spirit of teamwork, and for safe streets.